This is the 6th in a monthly series of posts written in coordination with selected pool bloggers. For the month of April it was my turn to choose the topic, and after giving it a lot of thought, I went to the heart of the matter and wanted to know "the most important thing about pool". I have been studying, practicing, taking lessons, competing, teaching, and writing about pool for the last 6 years, and not once have I heard or read anything claimed to be "the most important thing". And yet it seemed to me that there had to be *something* at the top of the list of really important things you had to know/do/be/think to truly master the art & science of pocket billiards. This was my opportunity to ask other pool bloggers to consider the matter deeply and to share their secret of pool with me, and the world. The only problem with this plan is that I had to deal with the issue as well. And now I have a greater respect for the difficulty of the task than I did when I first came up with the topic! Without further delay, here is the list of 10 pool bloggers who have had the courage to take on the challenge. They are listed in no particular order, as I wouldn't want it to be misunderstood that they are being ranked based on their writing. I know some of these people personally, but most I have never met except through their blogs. You will notice that some of the names below are professional players and/or pool writers. Some list only a first name, and some list only an obscure "handle" in an attempt to disguise their true identity, for whatever reason. This article is the 5th in a series of posts written in coordination with other pool bloggers entitled "PoolSynergy". This month's topic is "The Most Important Thing in Pool". and you reveal this secret truth just before you slip away. What is the Most Important Thing in Pool? It is your breathing. I know this to be true from personal experience, but I will not simply ask you to take my word for it; rather I will hope to show you the way to experience this for yourself, and to use it to take your game, and your life, to ever greater levels of excellence. Most people think very little about their breathing. After all, it is a relatively automatic function. We will almost certainly breathe enough oxygen to stay alive from one minute to the next without a lot of conscious thought on our part. It's the survival instinct built into humans, and all known living things. Breathing is the function of taking in oxygen for the purpose of mixing with the bloodstream to feed every cell in the body with this essential nutrient. Breathing will happen automatically if we ignore it completely and we will continue to exist. However, if we give some thought to our breathing, and control it in certain ways, we can completely change the functioning of our body and brain and emotions. And if we practice breathing in certain ways, we can achieve extraordinary things. Consider that one of the most important things that we can do to relax is to take a deep breath and exhale slowly, and repeat. Our best performance at pool, and life, will certainly occur when we are relaxed. When we relax, we are confident. And we know that confidence is essential in pool. Synchronize the timing of your breath and your actions. Exhale when you lean down to set your bridge, of course, and when you release your 9/8 ball break stroke (big exhale!). This is most likely going to happen automatically. But do you control your breathing so that you are most relaxed and synchronized with your stroke on a long straight-in shot. How is your breath changed for a long stop shot, or draw? Your breath will happen during these times anyway, of course, but if it is unfocused to harmonize with your shot, you will lose focus and energy, and your body will not deliver what you have in your mind. How does your breathing figure in to your pre-shot routine? Or, not at all? Ideally, your breathing will be a metronome to pace your movements, to keep you in rhythm, and soon you will slip into "the zone" where everything you do just flows, calm and easy. What is your breathing style when you have missed a shot? How do you breathe when you are waiting in your chair? It is so important to know these things if you intend to master this art form we call pool. If you are focused on your breathing, you will not be distracted. If you are focused on your breathing you will not be thinking about the score, or your opponent, or spectators, or whether this is an easy or tough shot, or whether your are hungry or have to pee. If you focus on your breathing, you will be able to create energy when you are tired, and yet be able to relax yourself if you become agitated. Consider that the ancient practice of yoga has for millennia brought strength, health, and well-being to those who do it. And yoga is merely focused breathing co-ordinated with various body movements. In fact, it was my intense practice of yoga for several years that got me to find the benefits of focused breathing. When I subsequently took up the study and practice of pool, I was amazed to find that there was virtually nothing written about breath control in the playing of the game. With experimentation and practice, I discovered breathing methods that worked very well for me. I practiced focused breathing with long straight-in shots from the rail, probably because I had often read that this is among the most difficult of all shots. With some practice, I learned that it was best to start to release my breath slowly and gently just prior to stroking through the cue ball, and continuing the exhale during the stroke and follow through. I learned that if I would do this, my probability of making the shot was greatly increased. Knowing this, my confidence on these shots was much improved, which in turn would further increase the probability of making the shot. It soon developed that this became my favorite shot, and I took great pride in being able to make these very difficult shots with consistency, and in fact looked forward to making these shots. Focused breathing releases stress, anxiety, worry, fear, and all manner of ugly, completely undesirable emotions, mind traps, and bodily conditions. Imagine how much better you would play if you were impervious to these energy and attention sucking parasites? As your breathing improves, so will your confidence. And soon you will notice that something wonderful starts to come into your game: a quiet smile will be faintly visible because you will be feeling so good on the inside that a smile is an automatic by-product. And with the smile you will feel better and be more naturally relaxed and more fully enjoy the game. As your focused breathing brings you new levels of excellence, you will, in time, achieve what can only be achieved by a higher order of being: Invincibility. However, we remain human beings, and we cannot inhabit this sacred place for very long. But while we are there, it is heaven on earth. To start down this path, I recommend yoga to learn the principles of focused breathing and movement. Apply what you learn to your game of pool. This month’s challenge by my friend “Fast Mikie” McCafferty is to impart the secret of pool into a concise phrase, if possible. This has special meaning to me because my Grandfather Charles “Pop” Eberle once asked Willie Mosconi what is the most important thing about playing pool. Willie told my Grandpa one word, “Touch.” So little and so much all at once. This had to be true for Willie as Pop reported that when Willie wanted to draw the cue ball 6 inches, he drew it 6 inches…when he wanted to draw it 8 inches, he drew it 8 inches. Even though I never really got to watch Willie play except a few trick shots and on tape, I knew it was possible because that’s the kind of control my Grandpa had over the cue ball, and that I got to watch plenty of. 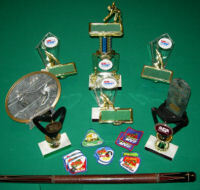 Pop ran countless one hundred plus runs in his career as well as innumerable racks of rotation, both games that require a high level of cue ball control. After developing my game and ability to make shots and control the cue ball with accuracy, my phrase for the most important thing about pool is: “Decide that you will make the shot, and exactly where you want the cue ball to go, then focus only on achieving that result until it happens.” This will require the luxury of focused practice, and persistence in the long term. In the short term on your current shot, it is what will create success time and time again. This is really the same thing as “touch” as Willie describes, because it is impossible to have touch towards something if you don’t know what you are touching towards. Once you know your outcome, then you can implement your talent into the touch category and develop it. Knowing your outcome will also produce the results you want more often in the competitive arena. Know that you are playing to win. Know that you are playing to run out. Know that you are playing to make this shot and land the cue ball “right there”. When you play with this kind of clarity, the details will take care of themselves. You will find the answers, the teachers, the success, the wins, and the pure enjoyment from shots, games, and tournaments well played. 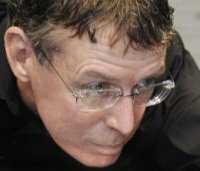 Jim Murnak is a builder of first class custom cue cases. I use one and like it a lot. interviews which you can find at this link. and surprised at the low-key persona of world champion Mika Immonen. There are more interviews there, and I look forward to playing them all. These are more in depth than what you might typically see elsewhere. with text from the left column bleeding over into the right column. I have no idea why, and it will take some sleuthing to dig out the buggy code. eventually learning where it hurts, fixing it and moving on. And, usually in such situations, I come out with something completely different.